I love taking things apart. I have been like that since I can remember. While everyone else in my family was playing with their newly unwrapped Xmas presents, I was taking mine apart to see how they worked. Sometimes itâ€™s a curse and other times it a blessing. Although this has stood me in good stead in my career and my hobbies, it can also get a little tiresome as people come to me all the time to get everything repaired. If I was to charge everyone a buck for every time I fixed something, I would be fairly wealthy. But I donâ€™t, because Iâ€™m a nice guy! 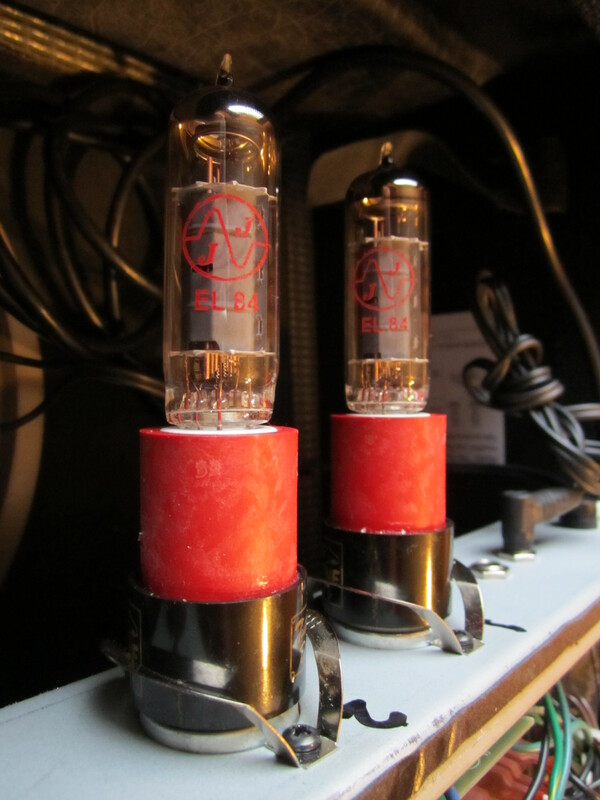 Being a fiddler I decided it was time to see if I could convert my amp from using 6L6 power tubes to EL84. 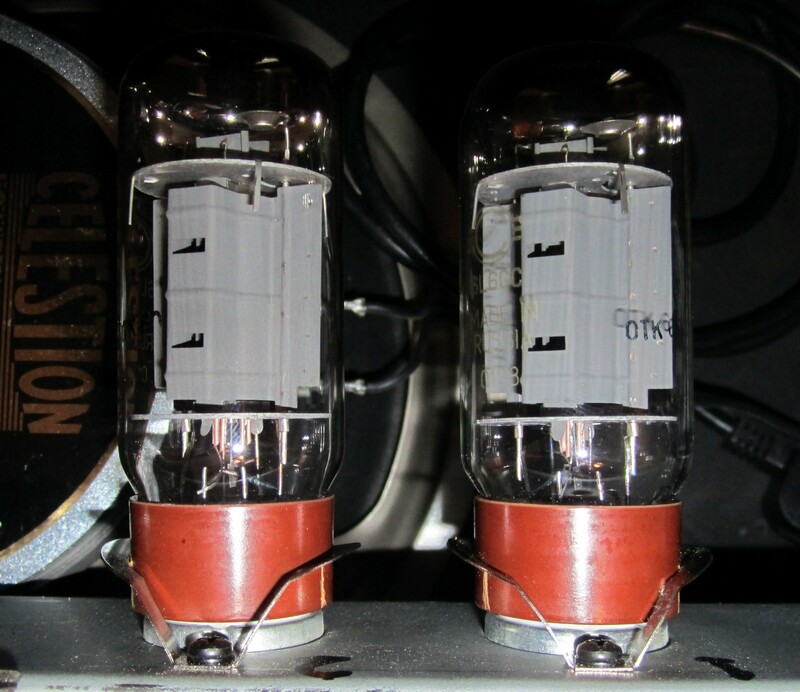 For those who donâ€™t know, the Fender Hot Rod Deluxe uses two 6L6 power tubes to produce around 40 watts of sound. At the gigs we do, a 40 Watt Tube amp is loud (even with a six foot two Canadian madman at the skins, I can still be louder). Most guitarists seek the tone produced by a tube amp when it is turned right up, the brown sound. But, when turned right up, the Hot Rod is deafening. So I decided to search for a way of reducing the power of the amp so I could turn it right up and not kill anyone. Enter the simplest/cheapest solution â€“ Power tube adaptors. These are â€˜thingsâ€™ that plug into your existing valve sockets and then allow you to plug in the new valves into them. This then reduces the power of the amp by a lot and allows you to turn it up. Great! Basically there are two main types that appear to do the same thing. Having had difficulty in trying to get any THD Yellows because they were not in stock, I opted for the TAD Tone Bones from Watford Valves. I had also heard that the Yellow Jackets had problems with heat and were warping at the sides. As well as that, the Yellow jackets were taller than the Tone Bones and this would cause a problem with space in the Hot Rod. I later found out you get reduced sized ones. TAD Tone Bones it was then, so I bought them. Went for the Pentode version. The Triode version reduced the power even further, but I was concerned about clean headroom. That was about 1.5 to 2 years ago I think and they have been running well until now. I have to say, I thought the tubes would have gone first, but the amp started hissing, popping and squealing just before the Bride and Groom arrived. In traditional style I gave it a thump and it started working. Lasted all night, but I couldnâ€™t wait to get it home to find out what the problem was. The next day I opened up the back and started gently tapping the amps chassis to see where the problem was. This is a typical fault finderâ€™s method. Switch the amp on, then start at one end and work your way to the other tapping until you find the problem. Well I certainly did. The Tone Bones. Something inside them was either broken or causing a poor connection. So, powered down, I took them out. My first thought was can these be repaired? Well, I say if it was built by man, then it can be fixed by man. I slowly twisted the red casing and it came right off in my hand without breaking anything, much to my surprise. Two curved plastic supports were siliconed to either side and they were easily removed. The silicon was a red colour which I later discovered was an indication it could withstand high temperatures and not the normal 75oC of most silicon. Removing these I could easily see that there were nine components connecting the two sockets and that was all. All the components were in good condition, however, there were three heavy duty diodes connected in series, but instead of being soldered, they were crimped. My first thought was that this wasn’t very clever, but there must be a reason? I quickly sketched down the layout, just in-case anything came loose while I was fixing it. Further inspection revealed that the component wires that were inserted into the valve base pins, were also poorly soldered. So I set to work re-soldering all the joints. The crimped diodes joins needed a lot of heat to get the solder to flow into the crimping, but I eventually got there. The only thing I needed now was to find some high temperature silicon that would work with the tube high heat. Didn’t buy this but found some other stuff that works up to 200oC and was clear instead of red. I only applied enough to hold it all together, but not too much so I could get it apart again if it screws up. So that’s it. let them cure for a couple of days and plugged them back in. Superb, back to the compression and crunch of the EL84s. This entry was posted in Repair and tagged 6L6, Bones, EL84, Fender, Hot Rod Deluxe, TAD, TAD Tone Bones, THD, tone, Tube Adaptors, Yellow Jackets. Bookmark the permalink. ← Bass is a community thing…. 10 Responses to "Converting a Fender Hot Rod Deluxe from 6L6 to EL84 using TAD Tone Bones tube adaptors"
Hey dude, thinking of buying some of these to stick in my jtm 45. I have read they do make an amp quieter, but take a lot of drive and presence out of the amp. Whats your take on this man. Do you think it’s just a case of the smaller output gain shrinks back the sound so this guys perception has been it takes away from the amp, aside volume, or do they mess too much with the amps sound, making it sonically poor? I have also read that attenuators take those extra harmonics in the high end out, so I am thinking the tone bone is the way to go to get big recorded guitar sounds withing too much spill in the studio. I would make sure first that your JTM45 can take these adapters. If it is using the 5881s, then it should work, but don’t take my word. In my honest opinion, I love the sound of my amp now. These adapters are superb in terms of sound quality. No loss of anything. Yes the amp is a bit quieter, but not much and yes it compresses a bit quicker but that is what you want, right? It can still overpower a six foot 2 Canadian drummer at full gig volume. I have used the amp outdoors (mic’d up of course to a large PA) on a big stage for a crowd of 2000 and it still had room to play with. But it still gives a great sound at lower volume. Check out my YouTube channel and you will hear some sound clips using these adapter. In my opinion they have turned my Hot Rod Deluxe into an 18 watt El84 monster and still with a beautiful clean channel. thanks for this schematic..ive been looking for it!! 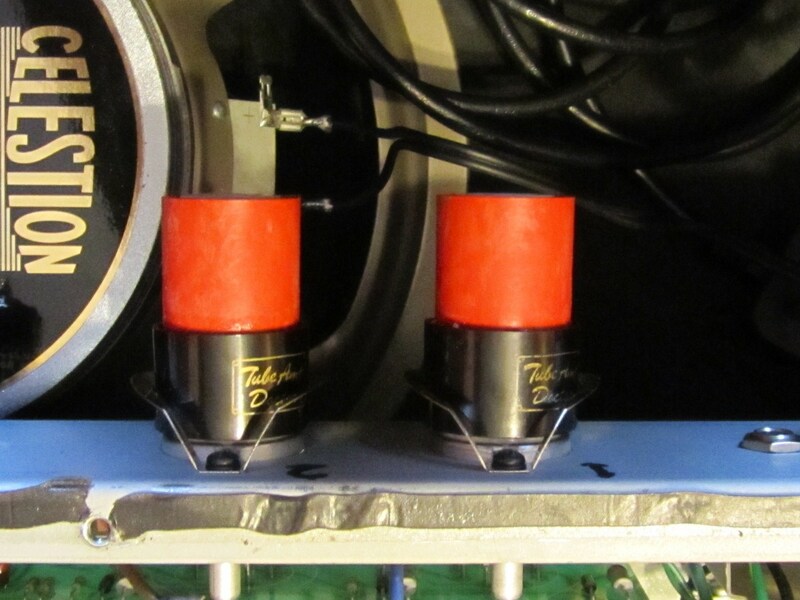 I wanted to convert my triode tonebones to pentode. The only differance in my triode tonebones is: there is no 666 ohms resistor neither a 1N5364B diode. This socket leg that has above parts in my triode tonebone its just connected through a 680 ohms resistor to before the 3 diodes in the row, just an 680 ohm resistor soldered from socket pin to socket pin. GT adapters from Fender usually burn out.They do not have any Zenner diode and they do not reduce B+ at all.I try to found Yellow Jacket schematic or even adapters, but no luck. I cannot find any diodes with the number 1N4364B. 1N5364B and 1N5378B are available but not the 1N4364B…. Anyone know for sure? You do not need to use 1N4364B, 1N4364 it will be just fine. Thanks for putting up that drawing of the Tone Bone Pentode 6L6 to EL84 adapter. 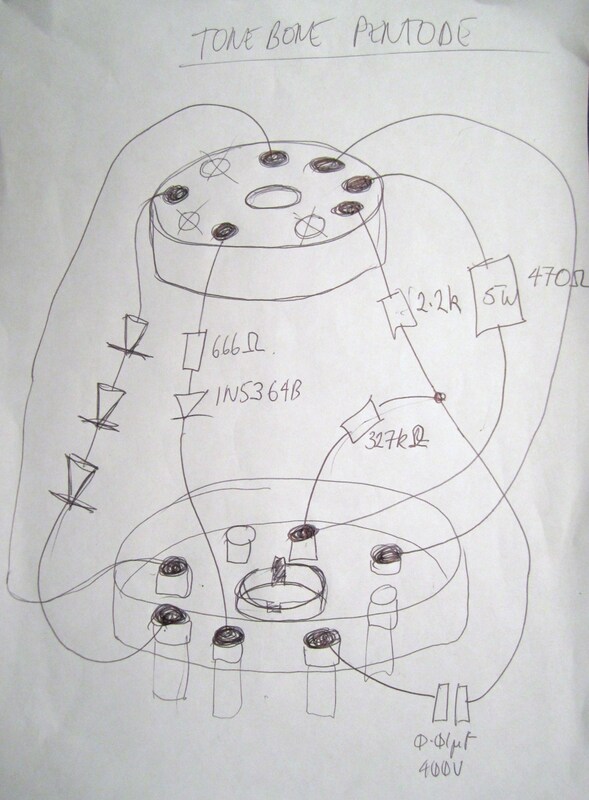 In trying to decode the magic of the adapter, I have a drawing showing the mapping between the pins. So far it’s making sense. Except for the three diodes in series. Are those drawn backwards, or are they some kind of high-voltage zener diodes? Feel free to email me so I can send you the drawing. It’s the least I can do to return the favor. Hey Brad, it was w while since I did this, but i a planning to open them up again soon. When I do so, I will post the results.